EA’s unique wholistic approach to planning & design significantly lowers Living Costs while providing year-round enjoyment. We have been pioneering the sustainability movement in Texas since the 1970s. Because life depends upon it. When you are ready to make responsible, informed decisions about the planning, design, and construction of the home, buildings, and surroundings that define your quality of life, look to Environment Associates. You can afford a green home! We’ll show you how. eaDesign for Life: provident, foresighted, well-prepared, prudent, practical, sensible, visionary. Environment Associates’ (EA) signature design approach, eaDesign for Life™, enhances livability during normal times with greater comfort and survivability at times of extreme weather and power outages. EA’s unique wholistic approach to planning and design significantly lowers our clients’ Living Costs while delivering year-round enjoyment. Passive design strategies reduce energy use, enhance comfort, and enable homes to go completely off-grid to become net zero energy (and even income producing) if desired. The use of healthy materials fosters healthier lives. Climate appropriate design, materials, and superior construction methods offer low-maintenance durability, thrifty operation, healthy indoor air quality, and design aesthetics that delight the homeowners and occupants. 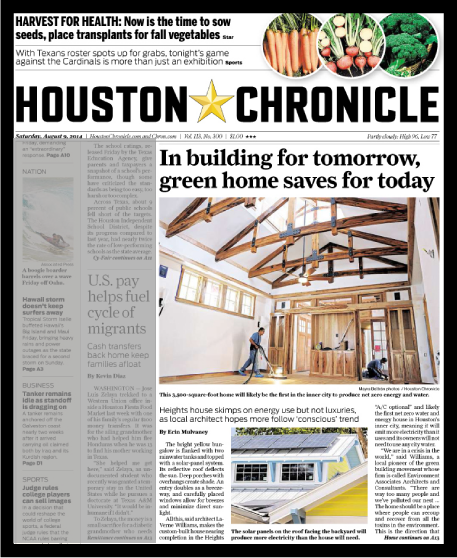 EA are the architects for the project which launched Texas’ green building movement in 1979, the Southern Solar Energy Center’s Houston’s Passive Solar Demonstration Home, toured by 30,000 people. EA’s founder’s work and participation influenced the creation of this nation’s original green building program, now named the Austin Energy Green Building Program, from which all the other green building programs are patterned, nationally and internationally. Environment Associates, Architects & Consultants, is also proud to be the first Houston entity to complete a Certified LEED Platinum project anywhere on the Planet. This project is also the first double award LEED/5 Star home, the first certified LEED Home, and the first certified LEED Platinum building project of any kind completed in Austin Texas, the birthplace of green building. 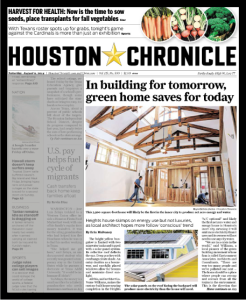 We are also the architects for Houston’s Integral Urban Homeplace in the Heights. As green building pioneers and a proven authority on environmentally responsible architecture, we serve those seeking superior solutions for where they live, work, and play. Quality of life, not a project’s size, is our concern.